(Review by Russell/photo courtesy of Jerry). Jazz-a-clap – or is it Jazzaclap? – opened the programme and as the title suggests band members engaged in a bout of hand clapping. The frontline horns of Sevgi Miller, soprano saxophone and Joe Baron, playing tenor, set the soloist’s bar. Lester Leaps In rattled along featuring Ryan de Silva booting his baritone sax (Ryan anchors the reeds in Jambone and also occupies the baritone chair in the excellent Early Bird ensemble) and a round of ‘fours’ effectively dispatched by Julian Gibson. 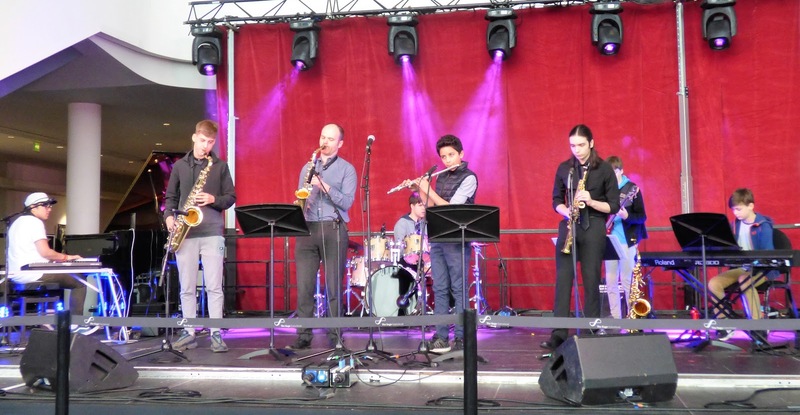 Members of Jazz Attack are encouraged to contribute to the development of tunes and some bring along pieces to the band’s regular rehearsal sessions. Ryan de Silva’s synth-infused 2018 A Space Odyssey featured a flute intro by Aryun Ullal. A recent recruit to Jazz Attack, Aryun made his mark and we’ll be hearing more from this young man, that’s for sure. MD Paul Edis likes to set the lads a challenging target, so, he suggested they play something with sections written in 6 and 7. And they did just that coming up with a composition titled What 13 Feels Like. The horns handled it easily, or so it seemed, as did the impressive rhythm section flying high thanks to the Wright Brothers – Alex, guitar, Theo, bass, and drummer Julian Gibson. You can bet your bottom dollar that these lads will be heard around town playing their own gigs in the not-too-distant future!